For super quick and consistent reaction times! A complete assembly including forged aluminum clutch basket, forged slider plate assembly, and clutch cover spacer with other model specific parts for RPM activated engagement eliminating manual clutch lever. 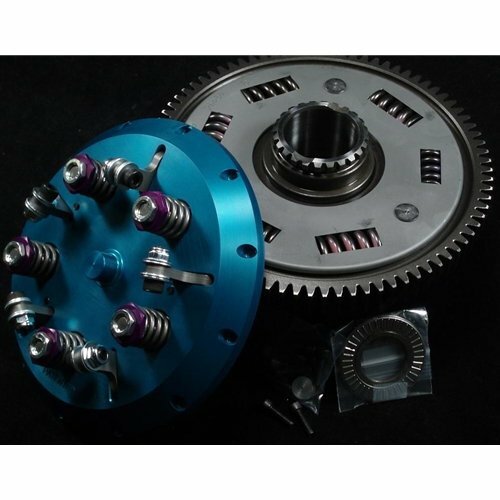 MTC Engineering's Patented Slider clutches are for the track only dragbike. These units completely eliminate the clutch lever. Engagement and disengagement are controlled totally by engine RPM, making them unsuitable for street use. Using centrifugal force to engage the clutch and eliminating the need for the rider to release the clutch lever results in lower more consistent 60’ times, lower ET’s than lever clutch equipped bikes and a smoother launch. The MTC slider is suitable for use in any length bike, with or without wheelie bars. Core’s Req'd: Outer basket w/gear, inner hub.